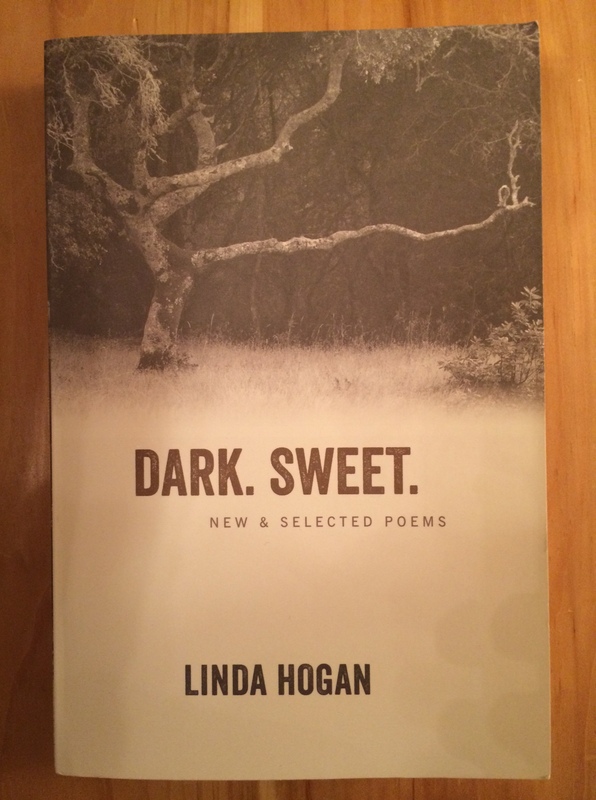 “This morning / when the chill that rises up from the ground is warmed”: Linda Hogan’s Dark. Sweet. Last year around Thanksgiving, I talked at little about Joy Harjo’s “Eagle Poem,” and I think I’d like to make it a tradition on the blog to feature poems by Native American poets during Thanksgiving week. I just finished reading Dark. Sweet. *, Linda Hogan’s new and selected poems, and I highly recommend it. Ms. Hogan, a writer and environmentalist, is a member of the Chickasaw Nation, and her poetry reflects both historical and contemporary Native American experience. Her poetry is deeply engaged with nature and personal experience; I loved its lyricism and its emotional engagement. The poems are particularly powerful in they way they capture the tension between the importance of place—rocks, trees, animals, water—and a profound and abiding sense of displacement. That sense of displacement is evident early in the collection; take the poem “Heritage,” in which the speaker recalls the gifts and images she associates with her family: “From my family I have learned the secrets / of never having a home” (19). Sometimes a poem drew me in with specific detail, like “Saving,” in which the speaker describes how she, and her mother, and her daughter save things “for good” as my family would say–the clothes that are too nice to wear, the “best towels”—and then expands from the carpe diem note into an exploration of the darkness at the end of each day and the ways we can step out of time. All things to be thankful for—because, as we know too well, or maybe not well enough, not everyone is safe, or alive, or able to love every step we take on earth. If you’d like to read one of Ms. Hogan’s poems in full, you can read the marvelous “Deer Dance” on her website (scroll down), and the Poetry Foundation has also collected some of her poems here. I especially liked The Sandhills. Another great choice!